Benno's Figures Forum • Entry Ready for "BFF Great Miniature Figures Parade"
Entry Ready for "BFF Great Miniature Figures Parade"
Re: Entry Ready for "BFF Great Miniature Figures Parade"
How much time I still have? I will return to Italy next week. I hope I have some time to finish my job. Mai Strac wrote: How much time I still have? The question is when the figures can be at my working table. I do not want to place your figures without a base on the table. Wednesday night - Thursday morning is too late? Sorry Jan, return delayed. I'll be back in italy in mid-June. Remcos figures including the FIGZ flagbearer have arrived as well. And I did not know anything from some of the others, but I think they are not able to finish their entries. I mailed off my Indian Fighters of 1855 yesterday. Postal employee says they will arrive with MABO next week. Last edited by Peter on 22 Nov 2017, 18:23, edited 1 time in total. No, it is a part of Gunnars work, Dykios entry and some of my figures. I am glad my figures finally arrived, it took so long that I tough they were lost. 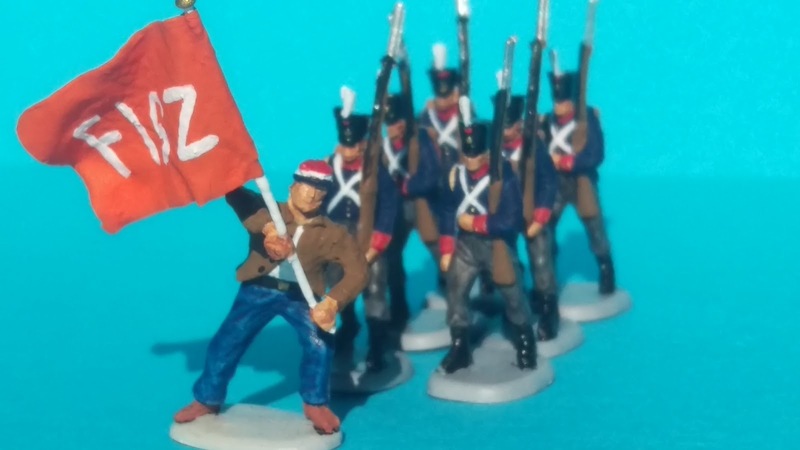 The flag guy didn't come alone, and yes I hated to paint them, thats why it took so long! I will make another post of them, whit some pictures of the whole parade at FIGZ. Last edited by Peter on 22 Nov 2017, 18:24, edited 1 time in total. The WIP looks great! Really really great! MABO I feel sorry for you, those guys sending stuff so late, giving you a difficult time (lots of stress ) to get everything ready before the show. What I can not figure out: do you make all of these bases yourself or do some figures come on a finished field already? DAD I watched your blog yesterday: Very surprising, that flag guy. I have the original figure in my collection too, but did not recognize it at all after you converted it. A very dynamic figure is the result. I make all the bases. That was my offer in the description. Only Arekmaximus - the King of Parcel - delivered a base as well. No base work involved or needed.However I did put colour upon my bases ,because I can live with untidiness upon my work tables,and even upon myself,but hate it on my figure platforms due to photo shoot presentation. Jan,you are doing a fine job on those bases,which makes all our joint effort at painting well worth while. I believe yours is the greatest effort because of the short time frame allowed to complete your promised work. As for those guys far to late in their promised painted figures,things happen in every day life, and time just seems to fly away. There is also a certain stress level experienced in group build painting, and both I and Gunnar certainly had that dragging upon our coat-tails. The Work in Progress,certainly helped out with encouragement, along with good banter and a clear understanding of certain pressures involved. Once the work is finished though it sure is quite a relaxed feeling of relief. Jan don't be on the forum, but work hard on the parade !!!! No serious, it looks fantastic already. I am one of those people. I can only apologise. No excuse; quite simply, my mind has been on other things for the last couple of months. Mine are individually based. I don't know whether that makes things better or worse, but I apologise for the inconvenience; I fondly imagined that you just set them up on a table, but I see you are undertaking some fine scenic work. Good luck and sorry to add to the stress.